The training workshop on test and item development, based on the model of literacy assessment, took place on 5-7 December 2016 in Almaty. This meeting was organized by UNESCO Almaty Cluster Office in cooperation with the Network on Education Quality Monitoring in the Asia-Pacific (NEQMAP) in Bangkok. Participants examined the world-renowned methodology of learning assessment and test development, conveyed by Dr. James Tognolini, the quality expert in education, presenting on behalf of the Pearson Assessment Centre (UK). 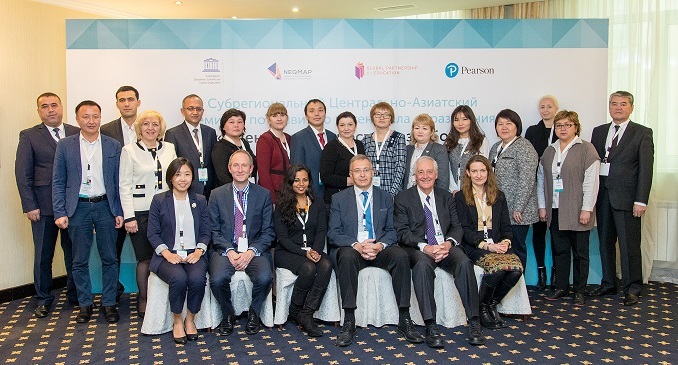 The experts and members of the national education assessment departments from Kazakhstan, Kyrgyzstan, Tajikistan and Uzbekistan took part in the workshop sessions on test development, analysis and evaluation of learning processes of the regional education model. They explored the latest global advances in learning assessment. This workshop served as a platform for sharing experiences among the invited specialists from the four countries of Central Asia. As noted by Dr. James Tongolini, test development requires a strong professional comprehension of assessment goals. He also highlighted that educators need to analyze students’ perception of testing. Furthermore, to improve the quality of education it is crucial to teach learners to think critically and apply the acquired knowledge and skills in problem-solving process. The aforementioned competencies are fundamental for society growth, sustainable development and the spread of global citizenship. According to Mr Andrei Chevelev, Director a.i. of UNESCO Almaty Cluster Office, the education system needs to work on assessment and learning methodologies to promote tolerance and intercultural dialogue in building inclusive society. It is necessary to strive away from the mind-based testing towards the evaluation of reasoning, critical analysis and creative thinking. By the end of the workshop participants grasped and compared the methods of testing quality assessment for various subjects in different educational institutions. They stressed the practicality of acquired knowledge, content quality and marked a high-level of logistical coordination. The workshop makes a solid foundation for systematic improvement in education quality monitoring for Central Asian states.